Is print advertising dead? Do people still read magazines? In today’s digitalized world it can be easy to assume that print advertising is dead. However, things are not as simple as they might seem at first glance. Although the assumption provided above certainly has some grain of truth in it, stating that the print advertising is completely dead would be an exaggeration. We still see ads in magazines and newspapers, don’t we? Well, that means print advertising is still alive and it still works. Print media is staying afloat despite all the negative predictions and skepticism around it. Even more, in some spectrums, it remains the platform number one. Well, let’s therefore dive a little deeper and see what research and data stand behind these bold statements. It is not an exciting experience anymore to browse websites and surf the Internet as it used to be a couple of decades ago. At that time the Internet was still a relatively new thing and was, therefore, more likely to trigger strong emotions compared to now. Everything related to the Internet, all those experiences associated with it felt novel and intriguing. Today, the Internet is an integral part of everyday life. It is just another regular constituent of a daily routine for millions of people. For some people, it is even part of their job. So, as the Internet is not that much exciting anymore the level of feelings and emotions it can transmit is also limited. Generally, we sense the digital world with our eyes meaning that only one out of five main human senses is in play here (except for video format where hearing is also added). Digital is not possible to touch and smell (yet). And this is where print wins. Journals, magazines, catalogs, newspapers – all print ad carriers are tangible and experiential. Generally, the human and print interaction is predominantly based on tactile contact (except for print ads that we see from the distance such as banners). They are materially real, and consumers can physically interact with them which adds two more human senses to the list: touch and smell. 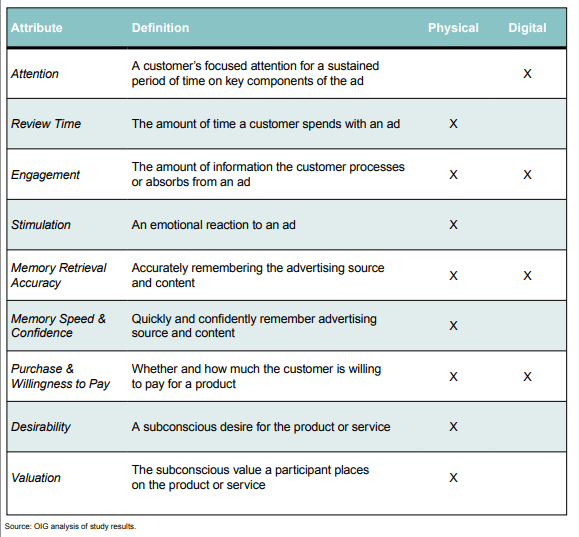 And all these play a huge role in how ads work in those environments and what results they deliver to businesses. U.S. Postal Service collaborated with Temple University’s Center for Neural Decision Making to conduct a neuromarketing study in order to find out the difference in human response to physical/digital media and its subsequent effect in the consumer buying process and purchase intent. Note: Neuromarketing is a scientific method that helps to explore the respondent’s subconscious response as opposed to conscious answers to survey questions. This method helps to understand the actual activity deep in the brain which leads to more reliable data. The study clearly showed that physical ads led to a stronger emotional response and participants remembered them better. Participants also spent more time on physical ads compared to digital ones which they processed quicker. As it can be clearly seen from the table digital lacks some of the important factors that print has. And it is not a fact that this lack is compensated by alternative factors of similar influence that can be attributed exclusively to the digital medium. Print simply establishes more emotional and natural contact with the reader. Unlike the digital ad carriers, consumers can physically browse through a print newspaper or magazine (and different types of print ads contained in them), grip the pages, feel the paper texture, density, and composition. More sense means more channels for ads to transmit the message into the consumer’s conscious and/or subconscious mind. In today’s omnichannel marketing environment these factors cannot be ignored. For the true omnichannel experience print is material. 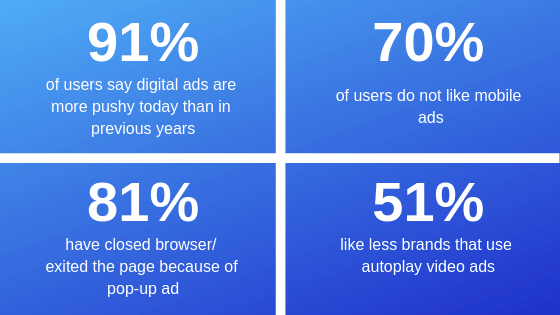 So, compared to digital ads print advertisements have an imperative and unique value: people do really care about them, people trust them, and people are actually paying attention to them. Let’s refer to some print marketing and print advertising statistics for additional proof. 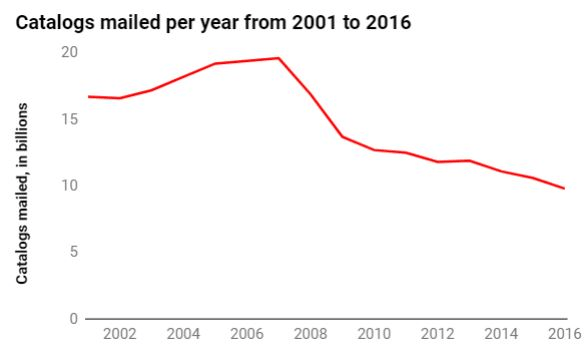 and generally, direct mail open rate is between 80-90% compared to 20-30% email open rates? It is needless to say how much valuable marketing potential all those numbers and facts entail. Today, consumer trust is one of the most scarce and precious components of the whole advertising realm. Although most of us probably expected the digital to easily win this spot, the study shows the opposite. 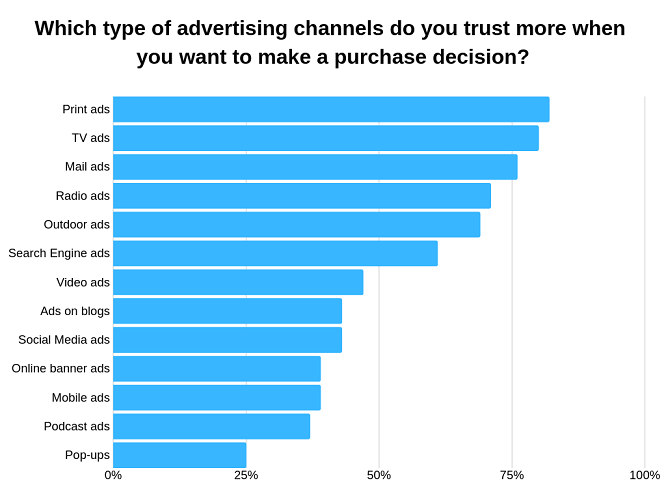 Print being the absolute number one together with other traditional advertising channels (first five spots in the table are occupied by traditional media carriers only) are still holding the leading positions when it comes to customer trust. And this is another critical aspect not to be ignored by marketers in today’s mostly digitalized world. Generally, traditional advertising channels are experiencing some sort of renaissance lately. Some of them do this by adapting to digital environment and/or transforming into a new digitalized format. Online radios and “mutated reincarnation” of traditional radio – podcasts are great examples of this trend. It looks pretty obvious that podcasts in their essence do not differ much from a radio except for their extensively digitalized nature. What is more, is that the listenership of both channels (online radio and podcasts) have been on a steady rise during the last years. In fact, the percentage of podcast listeners have doubled between 2008 and 2015 in the US (from 9% to 17%). Now 44% of American adults listen to podcasts (at least 35% do so while in the car) and 53% of them listen to online radio (73% on a smartphone, 61% on desktop and laptops). Importantly, the trend is currently continuing. The listenership of traditional radio (AM/FM) is also not going anywhere yet as about 91% of Americans listen to AM/FM radio at least on a weekly basis. Reading something online might easily turn into a real challenge with all those pop-ups, flashing ads and banners, auto-play videos and notifications appearing just next to what you read or even worse – on top of it. Although it is actually easier to get the reader’s attention with a digital ad than with a print ad (as we can see from the US Postal Service and Temple University’s Center for Neural Decision Making collaborated research above), it is nevertheless a real challenge to maintain this attention in such a distracting milieu. It is indeed difficult to keep your attention on something particular without being annoyingly distracted online. Reader’s attention on the Internet is almost always the subject of competition and therefore receives endless attention catch attempts. This naturally leads to distractions, distorted focus, and fatigue which affects any digital ad performance that is part of this bothersome environment. In contrast, this is not something that can happen on print. 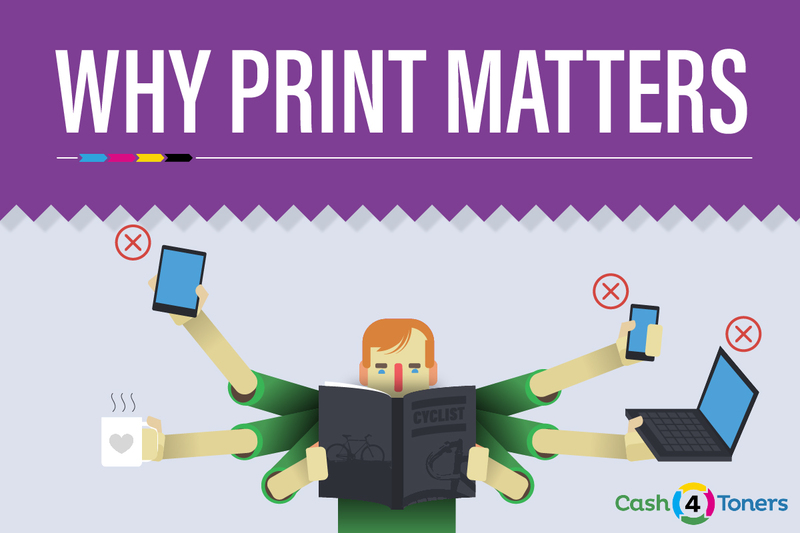 Print experience is much more relaxed and focused. There are not many things that can interrupt your attention when you read a printed magazine or a newspaper. Moreover, unlike digital media when reading magazines and newspapers the reader is not intentionally searching for specific information which is almost always the case on digital (reader is generally interested in print media including ads). Unsurprisingly, complicated information that requires stronger concentration is also better followed in print than in digital. Concentration needs to stay uninterrupted for a certain period of time to reach the levels that are enough for the reader’s mind to consume the complex information. Print media simply provides better conditions for this to happen compared to digital media. Print allows uninterrupted reading experience meaning that if you decided to read what you read till the end you have better chances of doing this without being unnecessarily distracted. So far, there are no pop-ups and push notifications (or any similar alternative) invented for print media. It is also less common to multitask when reading magazines and journals. People reading physical information carriers are usually just doing that and this is far from being the truth when it comes to reading something online. We usually massively multitask when we are online which makes this experience hectic and even chaotic at times. As a result, the experience online nine times out of ten is totally divided. You need to share the reader’s attention with other distracting things on the Internet. On print, in contrast, the attention for the most part is much likely to be 100% yours. As digital ads are getting more and more annoying ad blockers in the meantime are quickly gaining increasing popularity among internet users. 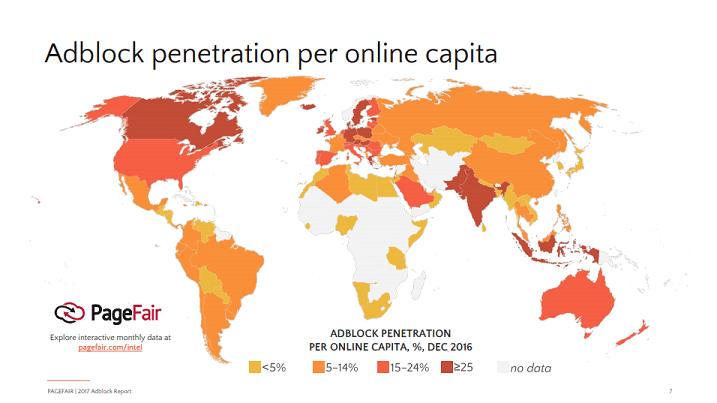 Ad blocker usage is currently on the rise. 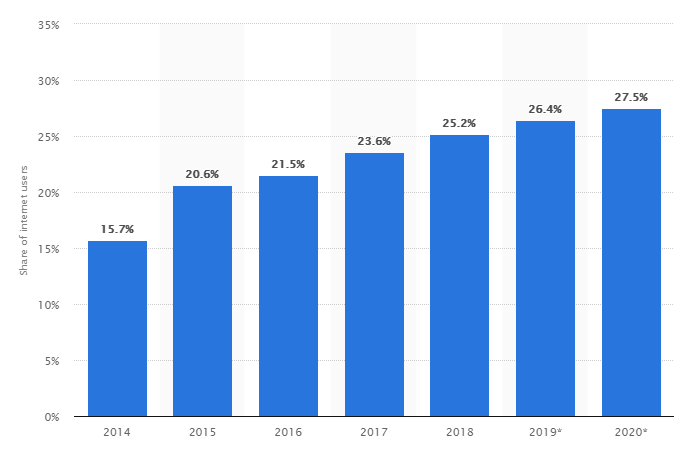 According to Statista, 25.2% of all US internet users used ad blockers to block ads on their devices in 2018. This number is expected to reach 27.5% in 2020. This is something that is fundamentally different when it comes to print ads. There are two important reasons behind that. First, consumers perceive print ads in a totally different way compared to digital ads. Print ads are an absolutely essential part of the whole print experience for which customers actually pay. Readers pay for the entire print experience as a whole and ads are intrinsic elements of this experience. This is not the case with digital media where ads are usually perceived as something completely inorganic and do not constitute the pleasing part of the user experience. Second, there is no ad blocking on print medium as such. There is simply no such technology to block print ads on print media, which makes print ad blocking technically impossible. So, you may not worry about your print ads getting blocked by ad blockers. As simple as that. Ads in today’s digital world don’t live long. They only live as long as there is still some budget left to fuel their presence. Once there is no budget left, digital ads stop working for you and just cease to exist on the Internet (until you fuel them again with additional budget). In contrast, this is not really the case with print ads. They simply live longer. Much longer. And they require no additional budget for that. It’s true that print advertisements take some time to get published and reach the user. Measuring the effect of print advertising takes even longer and is not as simple as it is with digital ads. However, once print ad is live it is hard to correctly predict for how long it will manage to be around. Your print ads might continue to live on the tables and desks, in hotels, cafes, offices and waiting rooms literally for years. And during all this time the ad you paid for only once will continue working for you. The number of impressions will keep rolling in during the whole lifespan of your physical ad. In this aspect, print ads are drastically different from digital ads for the better (unless you place digital ads on your own website which however also requires some ongoing maintenance budget). This difference (or often overlooked advantage) can be leveraged by smart marketers for smart and long lasting omnichannel experience in 2019 and beyond. For the foreseeable future, digital ads are unlikely to deliver a comparable opportunity. In certain industries such as travel, hospitality, and luxury print looks like the better platform for stronger exposure and ad effect compared to digital. With full-page visuals, paper choice and other available instruments marketers working in those industries can create a way better ad experience for users and more effectively pass on the right message to consumers. This, while certainly possible, is still relatively harder (and perhaps less effective) to do online. Users access web pages from different devices. Not all those devices have the same level of screen quality, resolution, and size. The effect of full-page high-resolution and visually appealing ad might be totally different on different devices (old/new desktop, smartphone, tablet etc.). For example, currently more than 39 out of 50 news sites are actually accessed by users from mobile and not from the desktop. There are just too many parts involved here to guarantee visually consistent ad performance on all device types. The advantage of print media over digital in this aspect is even more evident when we compare print to mobile. These two formats are just not comparable in terms of impact potential and visual effect. However, what is also true is that the print media is probably less important medium for purely practical purchases. For example, print is unlikely to compete with digital in office supplies ads or for purchases where brand/visual parts are less important and do not play a big role. In those markets print nowadays looks more like a supplement to digital and not like the primary advertising channel. Print is also not the best option for time-sensitive offers as it takes time for ads to reach users and provoke the necessary action. On the other hand, print works a way better for products and services with longer consideration times (such as cars and travel packages). Besides the mentioned industries there are specific market segments which print still reaches and digital does not. For instance, 41% of all Americans aged over 65 are not Internet users meaning that they do not go online at all. These people are simply not possible to reach with digital ads. Print advertisements in contrary reach both categories (internet users and people not using the Internet at all) with the same ease. What about catalogs? Do they still exist? You might be surprised, but catalogs not only exist, they still work. Particularly in the multi and omnichannel world. Smart marketers know that customers who interact with businesses through multiple channels are the most valuable customers. And catalog is another underrated and perhaps a little forgotten channel to do just that. However, it is true that catalog’s peak is certainly over and fewer catalogs are now printed every year. Nevertheless, it is important to keep in mind that this downward trend does not mean that catalogs are completely gone. There are still around 10 billion catalogs being sent every year and retailers allocate about $9 billion each year on print catalog marketing. So, in short print catalogs are pretty much still there. The numbers above also indicate that catalog marketing is becoming less crowded and that there is simply more room for catalog marketing in the digital age. The fact that the world became digitalized does not automatically mean that consumers stopped enjoying catalogs or other print marketing materials of a similar nature. In practical terms, customers who have an omnichannel relationship with the brand (including print) spend four times more than those who do not and print catalog certainly plays an important role here. The average spend of Internet-only shopper is usually around $80 per order. In contrast, shoppers who search a catalog before buying (including online) on average spend about $90 per order. Average online order is usually 6% lower compared to orders placed through a direct mail catalog. Around 86% of women (18-30 age group) make a purchase online after first seeing the item in a catalog. Roughly 58% of online shoppers browse print catalogs to look for ideas. One-third (31%) of them have a catalog nearby while making purchases online. 45% of consumers say that print catalogs stimulate their interest in a retailer’s products. So, surprisingly catalogs carry quite serious marketing power in an Internet-centered world of today. It worth noting that some companies experimented with getting away from catalogs and expectedly it did not turn out well. Thus, Lands’ End tried to cut back on catalogs back in 2000 which led to $100 million decline in sales. After conducting an online survey and finding that 75% of customers saw the item in the catalog before placing the order catalog marketing had been brought back. So, is print media dying? No, print is definitely not dead and not dying. 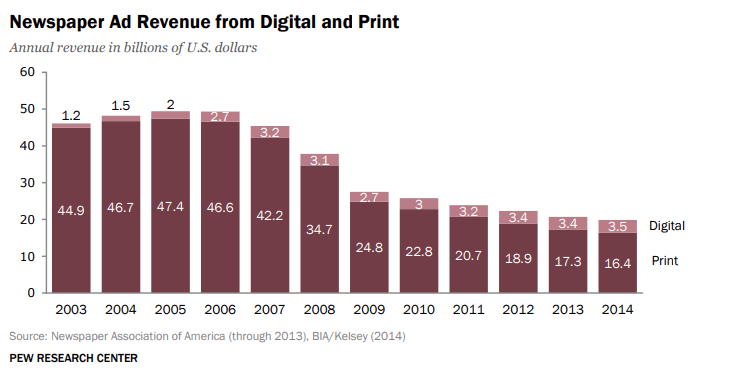 Note: Between 2005 (this was actually the peak ad revenues year for US newspapers with $49.4 billion in ad revenue) and 2014 US newspapers revenue sources changed from $47.4 billion in print/$2 billion in digital to $16.4 billion in print (that’s about 66% drop)/$3.5 billion in digital. Jobs also seem to be shifting from print to digital with 30 major and 438 smaller digital news organizations creating around 5,000 full time jobs. So, the overall trend is pretty obvious. But, in most of the cases, this overall decline also means that the readership has been narrowed down to the most engaged readers. Thus, 56% of people who read newspapers read them in print version only, 11% read newspapers on a computer and only 5% on a smartphone. Circulation magazines (despite the downward trend) are also still around (and are quite popular). Importantly, the audience they reach is usually the most interested and loyal audience who continue reading them which is a valuable factor from the advertising and particularly targeting point of view (including local print advertising). Accordingly, print readers today are naturally much more inclined to convert to your message. This actually turns out to be one of the primary advantages that print media currently provides. Today, print advertisements can be targeted to clear-cut audiences with specific interests and passions and this might transform into concrete and palpable business results with the right approach and proper strategy. Print also has a strong ROI index (direct indicator of print advertising effectiveness). According to AMA, GfK Panel Service (Germany-based research firm specializing in ROI) performed research and found out that magazines and newspapers deliver the highest ROI (125%). 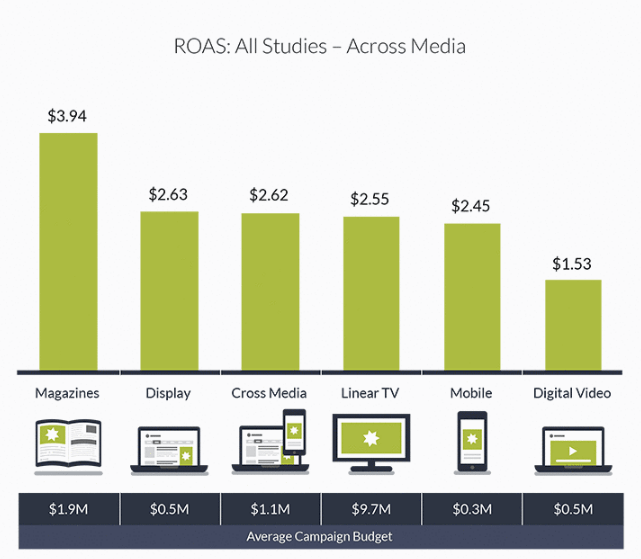 Far more (+38%) than other ad mediums such as TV and Digital (87%). As it can be clearly seen from facts, trends and data provided above print ads are here to stay (at least for another decade). Print media remains to be one of the most important and powerful mediums to reach the audiences and to perform marketing activities. More than that, print has adapted to the digital era. Most progressive publications such as Time Inc. these days offer print ads programmatically (presumptive future of print newspapers and magazines). Moreover, being a top-of-funnel medium, the print media is pure brand advertising and is therefore extremely important for boosting brand visibility and brand awareness (as it always traditionally been) as well as establishing brand worthiness and value in the market. So, do not remove print ads from your list yet. Print is still there and print still matters. Instead, try to unleash its hidden potential and leverage print media for the benefit of your business. comScore Media Metrix, January 2015, U.S. Please include attribution to cash4toners.com with this graphic. It’s so interesting. I would not have guessed that print is still more effective, but it makes complete sense when reading your points about the senses and how each are used. I’ll have to share this with my husband because he does graphics design and marketing for both print and digital. It really is great to see that print media advertising is still doing well. Gosh I remember those days of people saying paper will stop being used and then print media – nope to both. 82% of people trust print ads…..totally amazing – I honestly thought that number would be lower in this day and age. BTW I, too, love checking my mail. There’s nothing like reading a book or magazine the old fashioned way….as a hard copy! Even though we live in a digital age now, I agree that printing is still important and some people like me still value it! I not understand the advertising channels for making a decision. I am definitely a read reviews online type of person and recycle all print ads without looking at them. I am curious how those numbers will change over the years. I have never really thought about print ads. I am a huge fan of books, in physical form and getting pictures printed. I think both are important. I totally agree! I am a big reader of print magazines and definitely engage more with ads I see when flicking through their pages than those that pop-up when I’m online – they are much easier to ignore. Everybody does react differently. I never thought about the fact that once the Internet became ubiquitous that it wouldn’t have the same emotional impact. Fascinating data and infographic. The stats you crunch certainly make a persuasive case. I’ve always loved print more than online for some applications. I’m surprised to read that physical ads are more effective. Very interesting. I love that info graphic! I’m (still) a fab of print. Not sure if it’s my age, but I’m distrustful of what I see online. Really interesting information and graphic! I learned so much! Coming from print media, I am happy to read this article. The statistics are interesting. It’s sad to see so many magazines shutting down though. Hope they see a revival and continue to thrive. I totally agree. I have always love prints more than online. I find it more interesting and enjoying to read what’s printed compared to the digital version. After trying to go paperless for a long time at home, I have just discovered that I just love paper and paperback books and magazines, I just love to sit down and scroll through the mag without holding a device or being chained to a computer. I agree with many of the statistics outlined in this post. There is something about print media that is comforting and familiar. I know that for myself, I retain much more information when I’m reading a printed page versus a digital page. This was fantastic. While I will go online to look up something or get reviews. My mother is the opposite. She goes to Angie list book we receive in the mail, to find help for around the house. And when I read an ad from a magazine i believe in, it holds more weight, than just seeing it for the first time on the internet. Makes me think about my advertising dollars for my business in the future. Yes!! I love reading print. Such a different impact to be holding actual material. I do read print magazines and keep some of them because of their photography and aesthetics! I had no idea of the statistics but in my personal case print ads have an impact. I don’t pay much attention to popup ads or other online ads, but I do seek for reviews online to have in-depth or qualified opinions about products and services. Trust the power if print, Courtney! I used to think that print media would be long dead after digital advertising is dominating so much. Thanks for clearing my doubts. 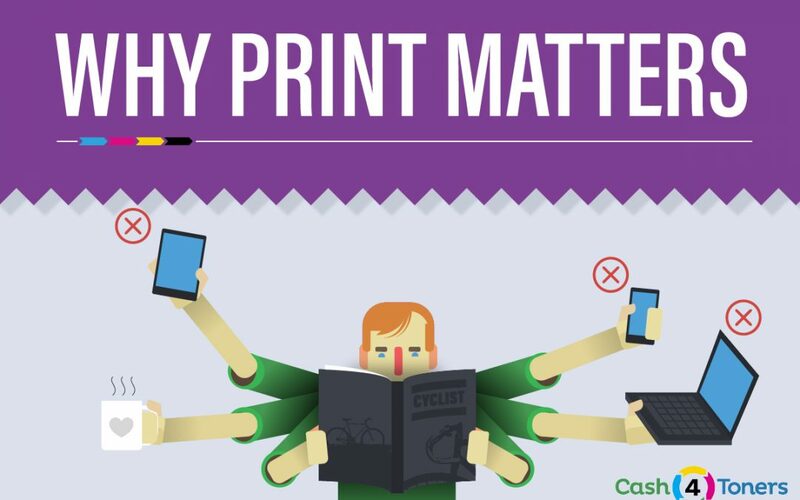 Print does matter! I love reading magazines and books that are not digital. As well as receiving letters from family that are not emails! My father worked for a newspaper company for 28 years, then they laid him off and shut down the printing warehouse. I never thought that newspaper would stop being paper. I love the feel of paper in my hands while I’m reading, whether it’s a newspaper or a book. I’m a die-hard fan forever! So interesting. I would have thought that online would have ranked higher. There’s something to be said for reading something on paper. Thank you so much for this ton of information! I agree that print is not dead, only too often I find that people don’t print my images and then they come back to me saying that they lost their phone or USB …. so frustrating! I agree that print is not dead. I always stock up on print for traveling on planes for work. The printed word has always been, and I believe will always be, more valuable than other media. People trust the printed word if for no other reason than it takes far more effort to produce and the assumption is that if you take the time to put something in print, it must be true. Print media has it’s own place. I prefer newspapers, magazines than digital media. Reading newspapers, magazines has it’s own charm. I totally agree with you on this, I mean I trust printed words than other media. There have been so much hyped about other media which turns out to be lies. Trust the printed word, Lydia! This is an exceptionally well put together post. I myself love holding a book or a magazine, there is something satisfying about a tangible product. Thank you for keeping this information out there. This is really interesting! I still highly enjoy print media. I love getting catalogs in the mail. I am definitely one of those people who likes to physically hold information in my hand. I think I absorb so much more when reading actual print. Print media engages all the senses, Holly! This is an intriguing argument. With all the technological transformations going on, one would assume right away that print advertisement is a thing of the past. So, thank you for sharing this info. Interesting article! I would never have guessed that print media out performs digital in most categories. While I prefer actual magazines over digital and could see the lasting effect of advertisements, the rest of it finds my recycle bin before it even comes through the front door. I definitely prefer print over digital. Digital is so much more widely available that I end up using it by default. These are some great statistics! I honestly did think print was dead but you make a great argument that its alive and well and necessary! Thanks for reminding us that there is still print in this world because everyone is all about social media and forgetting we had print before social media. Great post. Print media has its own charm, till date in the morning having our cup of coffee and reading newspaper is still my routine, without that I feel something incomplete in my morning 🙂 online media is always second option if newspaper has not come for any given reason. Thanks..! Come on, newspaper boy! Don’t let us down! We love the crisp feel of a fresh newspaper too! These stats are interesting. I much prefer digital, but I know it’s not for everyone. When it comes to reading a book, I prefer print over digital. Something about reading a printed book makes me happy. Besides if I read a book on my phone or Kindle for too long, it hurts my head. We appreciate a lady who appreciates the heft and feel of a good book, Jessie! Print seems more “real” for me as a customer. There is a lot on the internet and a lot that is just spam or feels like spam so you sort of become blind to ads. Believe in the reality of print media, Tiffany!